When it comes to recent running backs, none have impacted the hobby more than Adrian Peterson. While it may be a little early to place him in the upper echelon of all-time greats, Adrian Peterson cards have their place in history. His rookie cards, which were released in 2007, came at a time when high-end traits like autographs, jersey swatches and low numbering were all coming together and driving the direction of the hobby. While these things were in vogue before, by 2007 they were hitting the collecting mainstream like never before. Shop for Adrian Peterson rookie cards on eBay. Collectors have no shortage of options when it comes to Adrian Peterson rookie cards. He has base cards in more than three dozen sets. Prices range from a couple of dollars all the way up to several hundred, if not into four figures. After tearing both his ACL and MCL in December, 2001, Peterson returned to the Vikings in 2012 as dominant as ever. 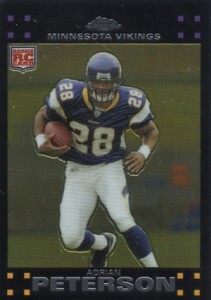 Adrian Peterson rookie cards made a similar comeback among collectors, rebounding back to the game's top tier. 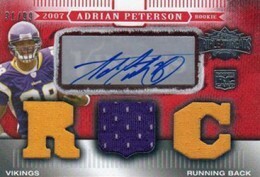 Below is a list of ten of the best Adrian Peterson rookie cards. Although secondary market value plays a major part in the rankings, brand recognition and overall hobby impact also play a part. There are no shortage of autographed Adrian Peterson rookie cards. That said, the 2007 Upper Deck Sweet Spot may be one of the most unique. The signature comes on a helmet pieces that's embedded into the card. So while the card itself isn't hard-signed, it still look better than most of the sticker autographs that are out there. The 2007 Topps Chrome Adrian Peterson isn't his most valuable rookie card. But that doesn't mean it's not popular. It's a great option for collectors who can't afford the high-end autographs and low-numbered cards. Topps Chrome doesn't come with any embellishments but year after year collectors flock to it. 2007 Topps Triple Threads Football marked the debut of the high-end brand. It's got the autograph, three jersey swatches and is limited to 99 copies. That said, the design is extremely busy and not in a good way. Something a little more subtle in the way of color would have been a big help. Even still, Triple Threads has its fans and this card still gets gobbled up. 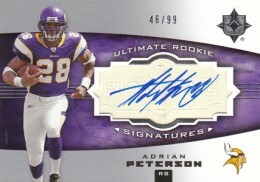 2007 Upper Deck Ultimate Collection Football has one of the cleanest looking autographed Adrian Peterson rookie cards. Numbered to 99, it's a lot less busy than others cards on this list. When it comes to autographed jersey rookie cards, SPx was one of the first brands to specialize in them. 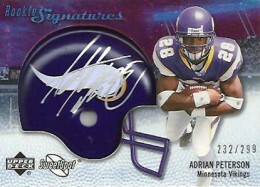 As a result, collectors continue to flock to the 2007 SPX Adrian Peterson. The sticker signature is unfortunate and the SPx lettering dominates the design, but there's still a lot of flair. 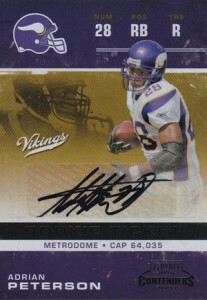 The 2007 Upper Deck Premier Adrian Peterson makes the list largely because it's his rarest rookie card. But with just 55 copies, it's perhaps too rare to have widespread appeal. The design is also not as strong as a lot of other Upper Deck sets. Contenders has been a favorite brand for rookie card collectors for several years. The distinct theme, rookie ink and lasting legacy of the brand have helped make it one of the most valuable sets each year. 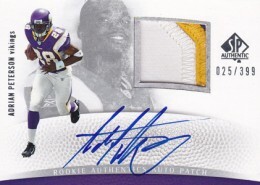 Despite a sticker autograph and a lack of serial number, the 2007 Playoff Contenders Adrian Peterson is still one of the running back's most popular cards. Although it doesn't have a serial number, its print run is confirmed to be 355. Proof that a low serial number isn't everything in the modern hobby, the 2007 SP Authentic Adrian Peterson rookie card consistently outsells many of its much rarer competitors. Why? Brand recognition for one. SP Authentic has long been popular with a broad range of collectors. Set builders, rookie card collectors, player collectors and more all vie for singles. 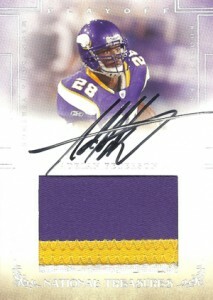 The card also looks great, including an on-card signature -- something that's sadly rare among Peterson's rookie cards. Playoff's answer to Upper Deck's Exquisite, the super premium line combines autographs, memorabilia and low numbering. Adrian Peterson's rookie comes in the brand's sophomore outing -- a time when it was still finding its way. Although attractive, it isn't as dynamic as some of its competitors. When it comes to the top Adrian Peterson rookie cards, it's really not even close. 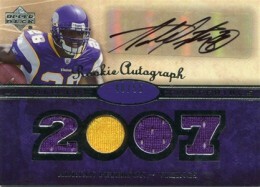 The 2007 Upper Deck Exquisite Collection comes with an on-card autograph, massive patch swatch and is numbered to 99. Many cards on this list share the same rarity, but none of these high-end options have the brand recognition that Exquisite does. ADRIAN PETERSON 2007 AUTOGRAPHED WCG GEM-MT 10 "23KT" GOLD ROOKIE CARD! VIKINGS! 2007 Finest Black Refractors #112 ADRIAN PETERSON rookie BGS 9.5 ALL 9.5 SUBS!! 2007 FINEST #112 ADRIAN PETERSON ROOKIE LOT OF 2 PSA 10 " GEM-MT "